Ana is a spatial scientist with a research background in geostatistics for environmental applications. She has been involved in research projects which use geostatistical modelling to quantify and map environmental data. Besides her research in geostatistics, Ana has provided environmental consultancy services to private and public companies concerning contamination assessments and environmental strategic assessments. Ana's current research interests include geospatial data analysis and integration, environmental modelling and uncertainty assessment. 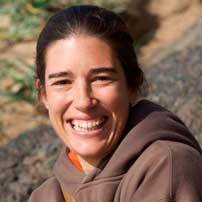 Dr Ana Horta is a Member of the Pedometrics Advisory Group 2014-2018, Pedometrics Commission of the International Union of Soil Sciences; and a Member of the Medal Committee of the International Spatial Accuracy Research Association. Dr Ana Horta is a member of the Editorial Board for the journal Geoderma. Romanelli, J.P., Silva, L.G.M., Horta, A., Picoli, R.A. (2018) Site Selection for Hydropower Development: A GIS-Based Framework to Improve Planning in Brazil. Journal of Environmental Engineering . Fator de Impacto (2016 JCR): 1,5410, v.144: 04018051-1 - 04018051-10. Horta, A., Pereira, M.J., Gonçalves, M., Ramos, T., Soares, A. (2014) "Spatial modelling of soil hydraulic properties integrating different supports", Journal of Hydrology, 511, pp 1-9. Horta, A., Correia, P., Pinheiro, L., Soares, A. (2013). "Geostatistical Data Integration Model for Contamination Assessment", Mathematical Geosciences, 45(5), pp. 575-590. Horta, A., Soares, A. (2010). "Data integration model to assess soil organic carbon availability", Geoderma, 160 (2), pp. 225-235, ISSN 0016-7061, DOI: 10.1016/j.geoderma.2010.09.026. Horta, A., Soares, A. (2010). "Direct Sequential Co-simulation with Joint Probability Distributions. Mathematical Geosciences, 42(3), pp. 269-292. Horta, A., Bishop, T. (2013). Spatio-temporal analysis to improve agricultural management. In Margaret A. Oliver, Thomas F.A. Bishop, Ben P. Marchant (Eds. ), Precision Agriculture for Sustainability and Environmental Protection, Earthscan Food and Agriculture Series, London, Routledge, pp 119-132. Silva, L,G., Pearce, L., Mabon, S., Horta, A., Duffy, D., Kopf, S., Ning, N., & Baumgartner, L,J. (2018). Macca’s in the Mannus, Macquarie perch refuge in the Upper Murray. ILWS Report No 114. Pearce L., Silva, L.G., Mabon, S., Horta, A., Duffy, D., Ning, N., & Baumgartner, L.J. (2018). Finding forgotten fishes, the search for two endangered species in the NSW Murray Catchment. ILWS Report No 112. Assessing and developing a walkability index targeted to older Australians in regional cities. Whitsed, R., Horta, A. (2018-2019) Family & Community Services – Liveable Communities Grants, $30,000. Towards a space-time observation system for subsoil moisture content. Richard Claude Mankin Fund (2013-2014). Soil contamination risk assessment (Case study: Barrinha de Esmoriz) Portuguese Foundation for Science and Technology under contract PTDC/CTE-SPA/69127/2006 (2006-2010).